Food is a huge part of my life - I love to eat, I love to cook, I love to try new food - and at this time of year I have a tendency to fall even more in love with cooking than usual. For the past few weeks I've had some serious cravings for warm, spicy foods like curry, chilli, and a variety of spice-infused soups. This happens every year when the cold starts to set in and is always magnified when I myself have a cold, which I have had for the last two weeks. I think it's good to make meals from scratch, both for the physical health benefits (only putting the good stuff in) and for wellbeing. As long as there is no pressure, cooking can be such a relaxing activity. It's something to channel all your energy into, something practical, and it feels good to know you're feeding your body what it needs. I'm a huge advocate for putting a on podcast or some music and cracking on with it (dancing is required if you opt for music, obviously). Sitting down to a meal you've prepared, cooked and served is a wonderful feeling and quite the achievement. I'm certain it makes the food taste better too. 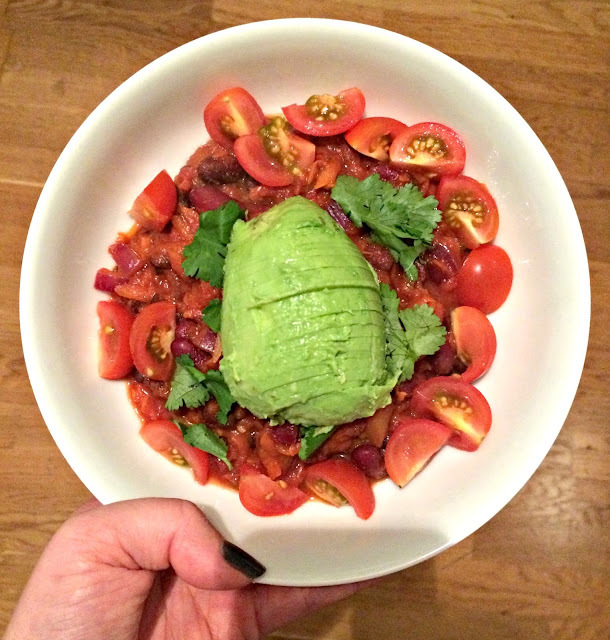 For a little while now my favourite thing to cook has been beanie chilli, which I'll serve with a generous portion of avocado and cherry tomatoes instead of rice (at 25 I am still unable to cook rice). Initially the recipe was from Deliciously Ella's cookbook, but after the first go I amended it somewhat to add some flavour. Now, I call myself an experimental cook*. This means that I can get away with my food never tasting the same twice - I'm terrible at measuring and following recipes so generally I just guess what would taste good and bung it all in a pan, hoping for the best. I'd say 99% of the time it works out quite well and thankfully five days of the week I'm only cooking for myself, but there have been occasions when it's gone quite wrong. I think my biggest failure was putting a shed load of extra hot chilli powder into some black bean burgers. I couldn't eat them and neither could my sister. Anyway, that explains why I've not put any measurements for this recipe - throw caution to the wind and just go with it! Or, you know, add small amounts until you're happy. 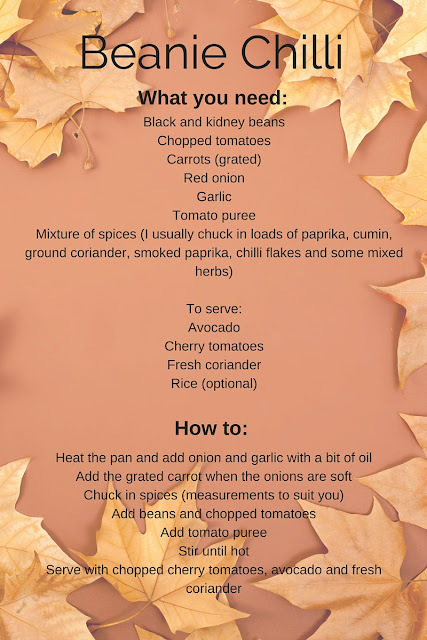 Either way I hope you enjoy this recipe. What's your favourite autumn meal? * this is very strange given that spontaneity is not something I'm good with, I love rules, I'm meticulous and I adore to plan. Hmm. I *love* making and eating chilli in the autumn - it's just the ultimate comfort food! Excellent shout on the avocado. We usually have ours with home made guacamole and, I'll admit, a cheeky bit of cheese because I'm a complete cheese fiend!